Photographers-animalists much depend on luck, great pictures happen to be taken incredibly easy. But you have to be patient often and work really hard to achieve the result. For example, this is photo of the wolverine, and it wasn’t made without a fortune. Wolverine is a pretty careful animal, usually active at dusk and night. They inhabit in the north of Eurasia and in the tundra, forest tundra and taiga of North America, in places where people almost never live. Wolverines are rare everywhere, their individual sites sometimes take up thousands of square kilometers, so where you can meet them? Hunters do not like the wolverine, destroy it by all means, because it pulls the bait from traps, and spoils prey that fell into a trap. It’s called the Demon of taiga . 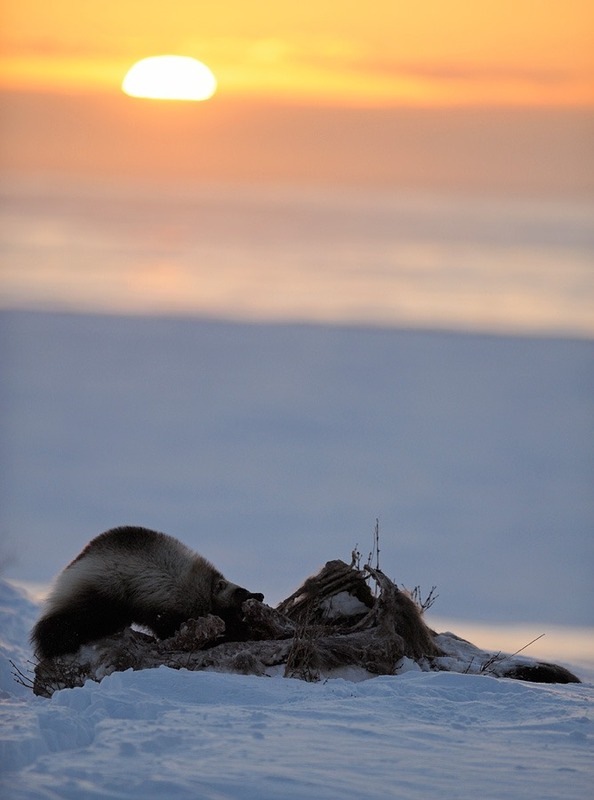 It’s partly true: the wolverine is an animal – collector, a beast of waste and desolation. Its purpose is to clear up the nature of the dead and weakened inhabitants in size from mouse to elk. Hence it is good at searching of the remains of animals, hunting traps and unreliable hunting huts with victuals. But there is no such thing as a harmful animal in this nature reserve. All the animals are under the protection of the law here, including wolverines. 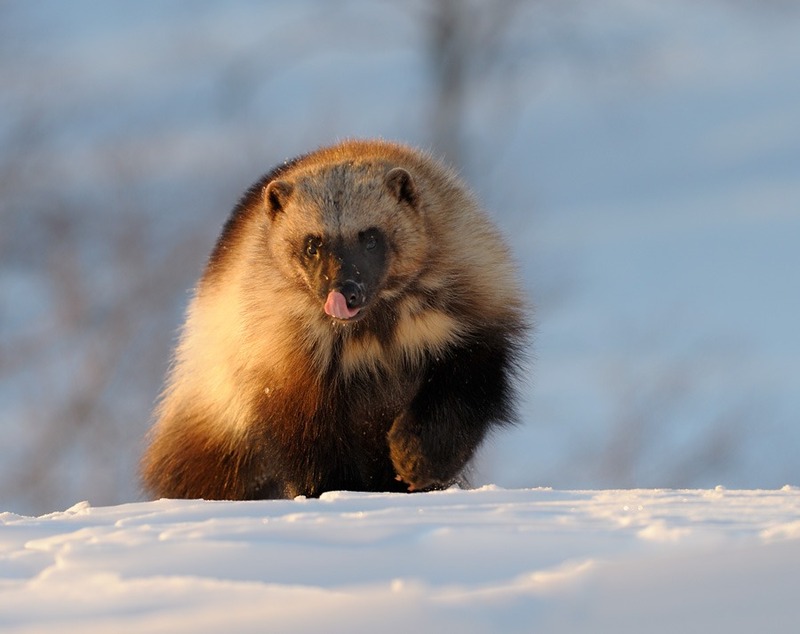 I dreamed to photograph a wolverine a long while, but it didn’t work, although I lived in taiga for months, saw their tracks every day … Not only chased I them, but sat in ambush so long. Alas, to no avail! The wolverine always notices me from afar and ran away. Died from hunger rogue bear helped me to take the first shots of wolverines February through March in 2008. Feathery vultures birds such as ravens and eagles began to peck his body. A few days later and four-legged vulture appeared: I saw traces of wolverines near it, first of one animal, then of two. I dug the hole into snow coat three meters high twenty meters from the rogue-bear remains, made a real bunker under the snow, closed up the entrance with snow bricks, leaving only hole for the camera lens. I was watching the wolverines for two days, but they only came at night, gnawing large pieces of the frozen bear and dragging it away into the darkness. The information about the deceased bear seemed to have been spread in taiga – four different wolverines started coming on the third day of observation. They gnawed remains from different sides, sometimes grappled with each other. But I saw it in the dim light of the moon, it was impossible to make photo. The skin, the spine and the head were left from bear- and I haven’t made any photos. And six wolverines came on the fourth day! Competition between them has become so high that the weakest could go to the food just before dawn, when it was possible to shoot. 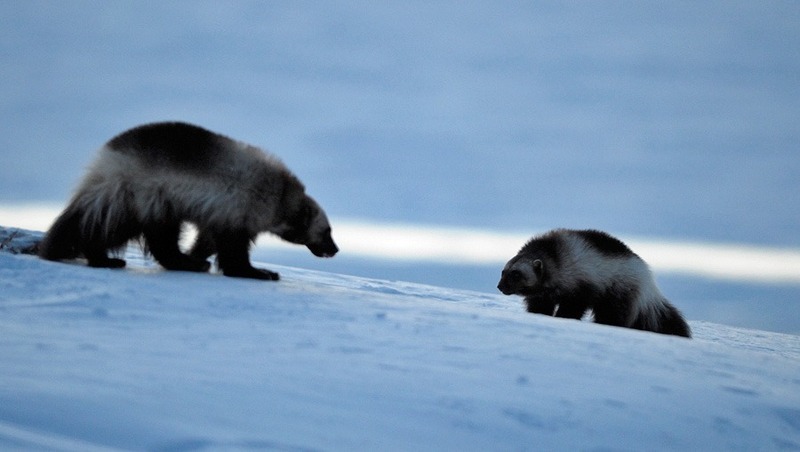 The first photo of wolverines-hatracks was made. Nature behavior, habitat, Kamchatka national park, Nature Park, strength, Wolverine animal photos, wolverine images animal. permalink.